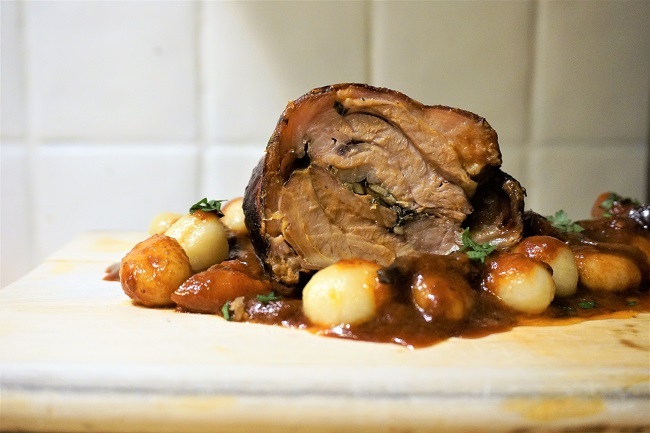 An easy and delicious lamb breast recipe – try out my slow roast breast of lamb recipe with gnocchi in a rich aromatic sauce. Lamb breast is really underrated, it’s cheap, tastes great and if you treat is right; a slow roast breast of lamb is deliciously succulent and flavorsome. Lamb breast is the same cut of meat as pork belly; why it’s not called lamb belly or pork breast I have no idea..
A good lamb breast recipe requires slow cooking. Lamb breast is a tough cut and is best when it’s had a chance to slow cook and release all those flavours and breakdown the meat. A good slow roast breast of lamb recipe will reward you with an incredible piece of meat that is tender and wonderful. I’ve specifically created this recipe as a family friendly dish; meaning it doesn’t take much prep and beside cooking the gnocchi for a few minutes in a saucepan everything else is cooked in the roasting tin in the oven. 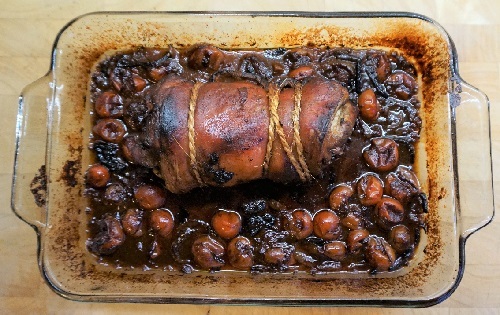 So, back to lamb breast recipes; there are tons and many by more an accomplished chef than me; but I personally love this recipe, the soft tender lamb breast, a rich tomato based sauce packed with aromatics of cinnamon, splash of balsamic and chilli flakes. Oh, and it tastes awesome. Here we go – my Roast Breast of Lamb Recipe with Gnocchi in a rich tomato sauce. Step 1 Lay the lamb breast flesh side up, season and paste over the crushed garlic, then drizzle half of the balsamic vinegar and rub into the meat followed by most of the herbs. Step 3 Place the sliced onion in a pile in the roasting tin and then rest the lamb on top. Drizzle with olive oil, season again and pop into a pre-heated oven at 200c for 30 mins. Step 4 After 30 minutes, remove the tin from the oven and add the cherry tomatoes, cinnamon stick, passata, chilli flakes, remaining balsamic vinegar and 1/2 a cup of water. Step 5 Cover with foil, reduce the heat to 160c and slow roast the lamb breast for a further 90 mins. Step 6 Once done, remove from oven, leave foil on top and let the lamb breast rest for ideally 30 minutes. Step 7 While the meat is resting, cook the gnocchi to packet instructions. Step 8 When ready to serve, tip the gnocchi into the roasting tin to mix with the sauce, remove the roasted lamb breast and carve into four and serve. Step 9 A little garnish of parsley is a nice touch. Step 10 Note: you can try adding the gnocchi into the roasting tin uncooked half hour before it is ready to come out – I’m pretty sure that would work but not tried it yet!